The Crystal River in Glen Arbor, Michigan, is known for translucent water and a switchback course that snakes through miles of forest en route to Lake Michigan. A glorious stretch of the river would likely be the centerpiece of a golf course today, were it not for a loan fund designed to save natural habitat in the Great Lakes basin. 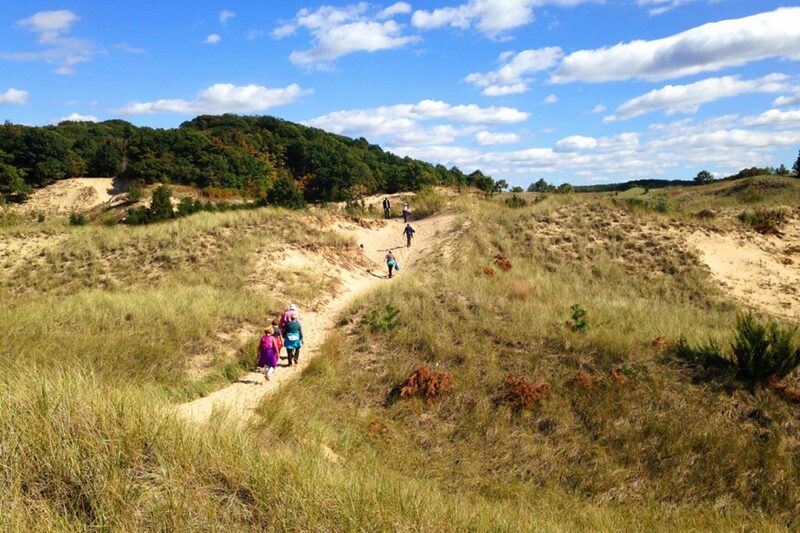 A $3 million loan from the Great Lakes Revolving Fund helped the Land Conservancy of West Michigan acquire 170 acres of coastal dunes adjacent to Saugatuck Dunes State Park. Once targeted for development, the property is now part of the state park. 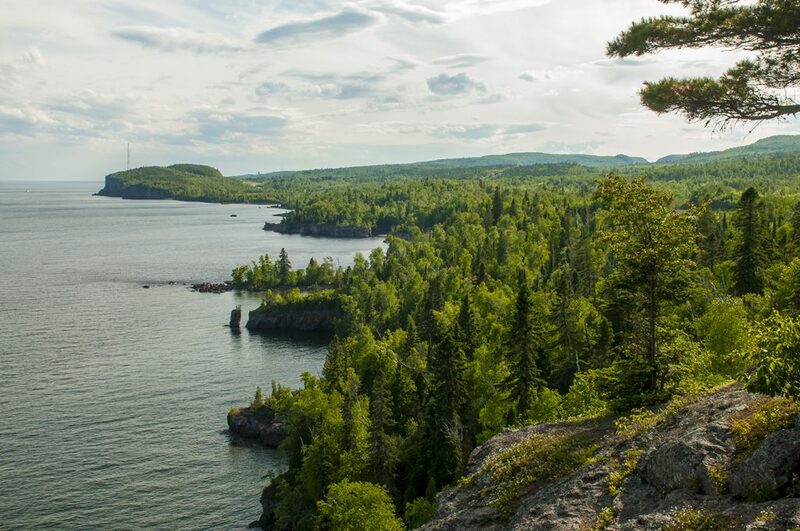 A land trust in Minnesota borrowed $475,000 from the Great Lakes Revolving Fund to acquire five acres of privately owned land within the boundaries of Tettegouche State Park, on the north shore of Lake Superior. The parcel was then added to the park. The Leelanau Conservancy borrowed $2 million from the Great Lakes Revolving Fund to acquire this 51-acre parcel on Lake Michigan. 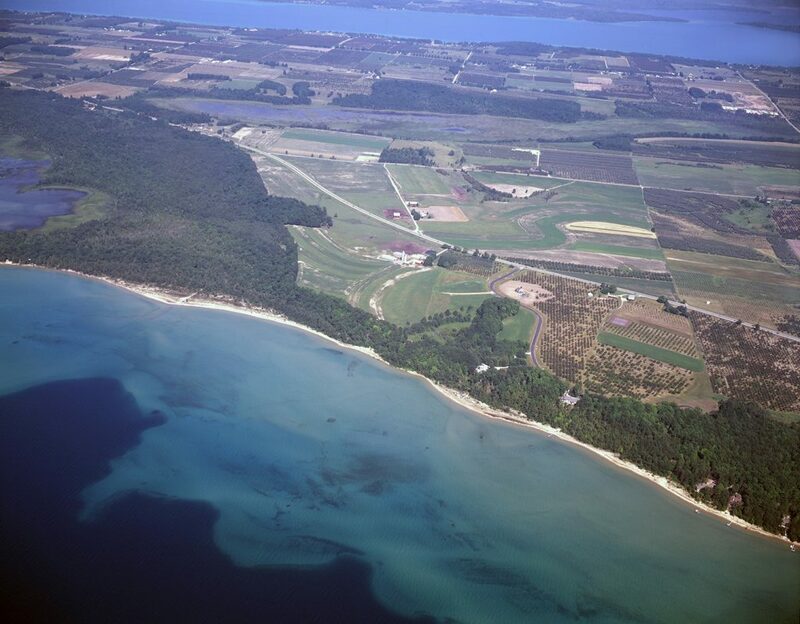 The land was added to Leelanau State Park. 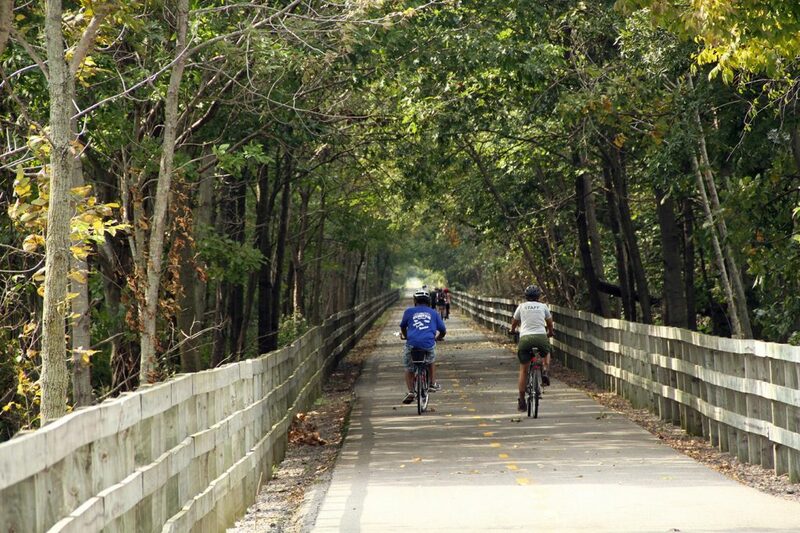 Bikers travel along the Oak Savannah Trail, a 9-mile trail near Gary, Indiana. It is part of a network of trails that links an urban area to the Indiana Dunes National Lakeshore. 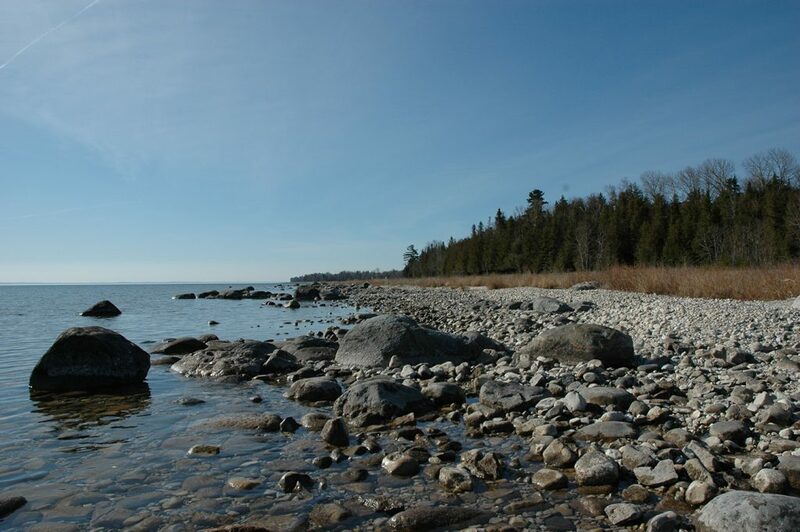 A $636,000 loan from the Great Lakes Revolving Fund was used to purchase and preserve 74 acres of land for the trail. 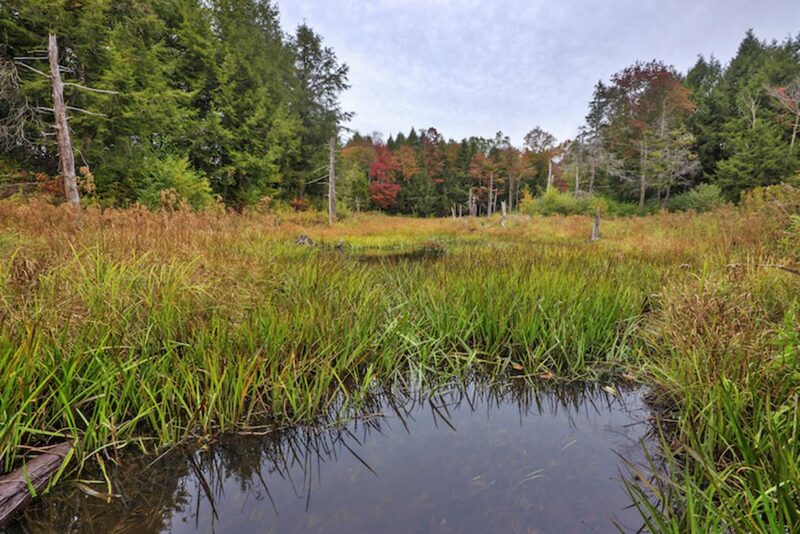 The Little Forks Conservancy in central Michigan used a $1 million loan from the Great Lakes Revolving Fund to acquire 419 acres of land along the Tittabawassee River. The site is now the Riverview Natural Area. The Great Lakes Revolving provided a $2.9 million loan to help the state of Ohio acquire North Bass Island. 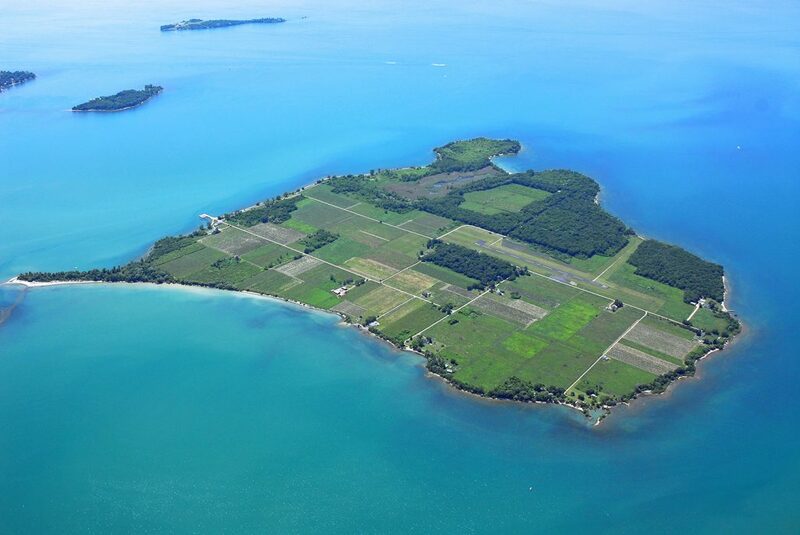 Located in western Lake Erie, the 590-acre island was home to a commercial vineyard for more than a century. It is now North Bass Island State Park. 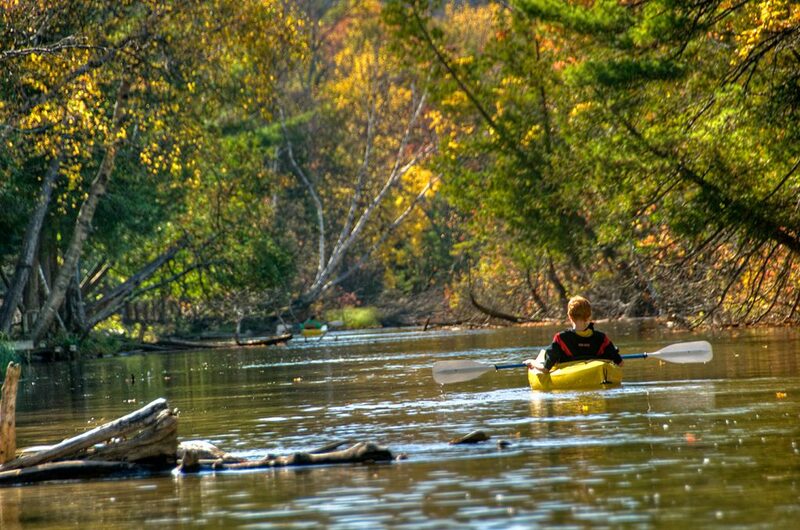 A kayaker explores a scenic stretch of the Crystal River near Glen Arbor, Michigan, where a developer wanted to build a golf course. A $2.2 million loan from the Great Lakes Revolving Fund helped the Leelanau Conservancy acquire the property, which was later added to Sleeping Bear Dunes National Lakeshore. The Grand Traverse Regional Land Conservancy borrowed $500,000 from the Great Lakes Revolving Fund to acquire a 58-acre farm on the coast of Lake Michigan. It is now the Maple Bay Farm Nature Reserve. 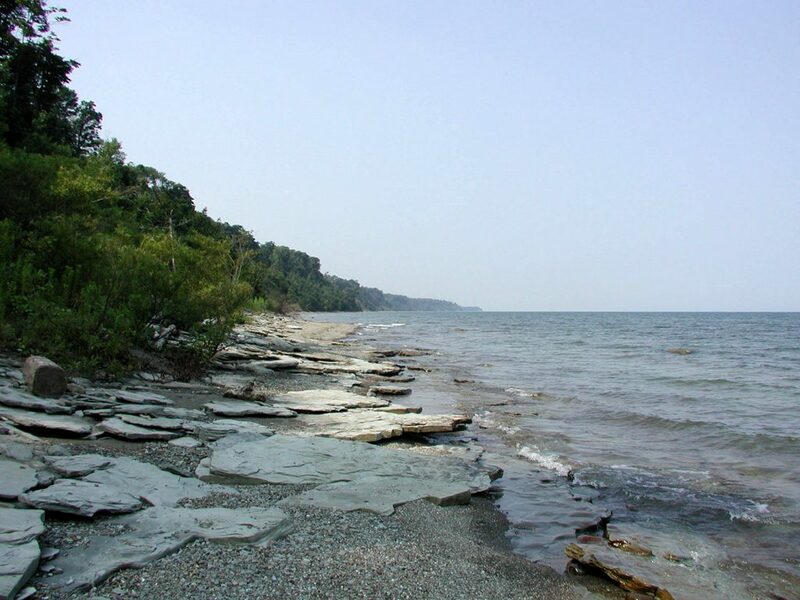 The Western Pennsylvania Conservancy borrowed $2.4 million from the Great Lakes Revolving Fund to acquire Erie Bluffs, the last mile of undeveloped shoreline along Pennsylvania’s portion of Lake Erie. It is now Erie Bluffs State Park. An angler fishes in a wetland that is part of Milwaukee’s Greenseams storm water management program. The program uses open spaces and wetlands to trap and filter storm water before it reaches Lake Michigan. 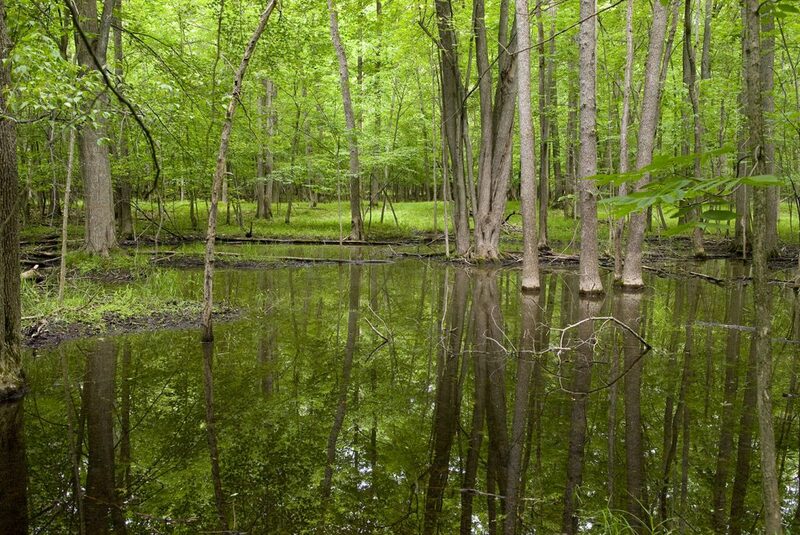 The Great Lakes Revolving Fund was used to purchase a conservation easement on 3,236 acres of “working” forest in New York. The easement prohibits future development but allows sustainable logging. 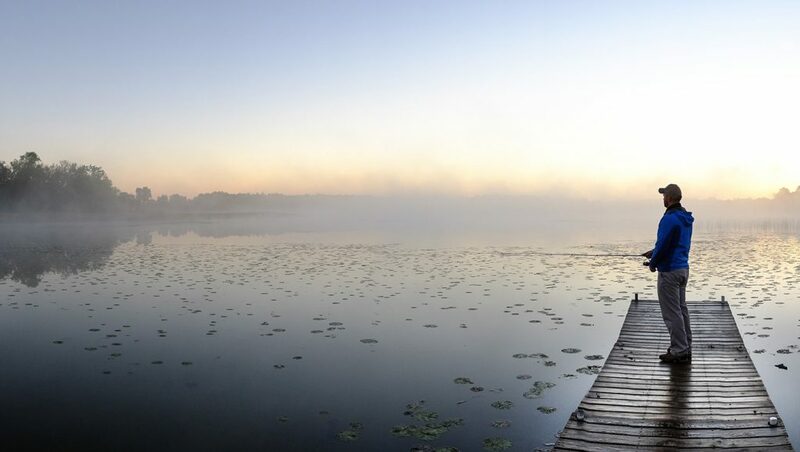 Among the earliest projects were two loans, totaling $2.3 million, to help the Leelanau Conservancy purchase 90 acres of land along the Crystal River. The deal, which totaled $5.5 million, resolved a highly contentious legal battle over the proposed golf course and ensured that the stretch of river at issue would retain its natural character in perpetuity. The land was then added to the Sleeping Bear Dunes National Lakeshore. 369 acres of wetlands and open spaces that the Milwaukee Metropolitan Sewerage District uses to trap and filter polluted storm water that otherwise would flow into Lake Michigan. Sam Passmore, director of Mott’s Environment Program, said the Great Lakes Revolving Fund has exceeded expectations. He said it has financed more projects, in more areas, than anyone anticipated. The Conservation Fund also leveraged Mott’s $7.7 million in grants into $58 million in land acquisitions. “The geographic spread and diversity of the projects, the number of acres protected, and the amount of money leveraged for additional land preservation is breathtaking,” Passmore said. Three factors prompted the creation of the Great Lakes Revolving Fund, said Peg Kohring, Midwest regional director for The Conservation Fund. In 2001, banks wouldn’t loan money to land trusts, land trusts couldn’t raise money fast enough to compete on the open market with developers and land speculators, and the Mott Foundation wanted to support large-scale land conservation projects. Kohring said she worked with Lois DeBacker, a former director of Mott’s Environment Program, to develop the concept of a loan fund that would level the financial playing field for land trusts. Case in point: In 2003, the Western Pennsylvania Conservancy borrowed $2.4 million from the Great Lakes Revolving Fund to purchase the last mile of undeveloped shoreline along Pennsylvania’s portion of Lake Erie. The 549-acre parcel became Erie Bluffs State Park. 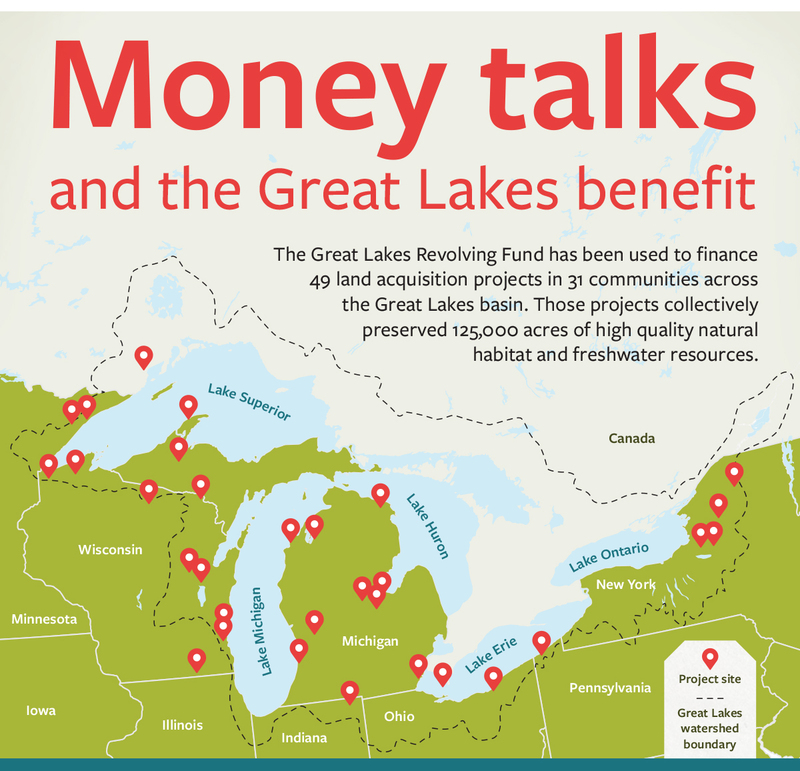 The success of the Great Lakes Revolving Fund prompted The Conservation Fund to expand its land acquisition efforts across the United States and Canada.